Or maybe anything about him at all? T.I. went on Breakfast Club this morning, where he revealed that Kanye West's public switch to far-right support of Donald Trump isn't exactly based in understanding of Donald Trump, what a president does, what policy is, or the goings-on of the world at large. "He doesn't think of [Donald Trump] as a person, he's thinking of the thing, whatever that force is." T.I. explained. "He loves the thought of [Trump]....he defied all odds...and in his mind, that's how it is. He don't know the things we know because he has removed himself from society to the point that it don't reach him." T.I. 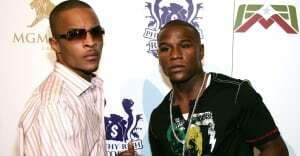 also said that West seems to think that revealing his far-right beliefs, like that American slavery is partially enslaved people's fault, is the same thing as his early decisions to wear chains with a backpack, which T.I. was perplexed by, telling the Breakfast Club, "I said, bro, do you really think that is the same thing? He's like, yeah! And I'm like, that ain't the same thing at all." He continued by saying that West had not thought about how his stance on Trump, who has been openly racist and misogynist since he began his presidential campaign, might affect his fans. But perhaps most significantly, T.I. revealed that West seems to have no comprehension of Trump beyond a thought experiment. ''He just started watching CNN," T.I. said. "I said 'so how you feel about the travel ban?' He said 'what's the travel ban?'" Thumbnail courtesy of Kevin Winter/Getty Images.